Browse the newest Highway 14 homes for sale below! For homebuyers who desire to be close to the best of The City Different yet still yearn for the ultimate in high-desert privacy and views, taking the trip down Hwy 14 and living a bit off the grid somewhere along the Turquoise Trail is a perfect fit. From Lone Butte, Cerrillos and Madrid all the way through to Sandia Peak, Cedar Crest and Tijeras, the wonderfully scenic and famously historic Highway 14 corridor connects Santa Fe to Albuquerque with a series of amazing communities that appeal to a variety of homebuyers. Don't just take our word for it! Browse the listings below or continue reading for more information about Highway 14 real estate. Create a hassle free account with Santa Fe Properties today to receive unlimited access to listigns and to be notified when a property that meets your search criteria becomes available. With listing prices ranging from $120K to a million plus, homebuyers are attracted to the variety of options available in the Highway 14 real estate market, including small to extensive acreage, nearby homes situated next to main roads or rural off-the-grid opportunities, modest adobe family homes andluxury custom contemporary builds. Moreover, the Highway 14 corridor also features an abundance of equestrian properties, often with facilities already in place, and riding trails nearby in the Cerrillos Hills Park and the Galisteo Basin Preserve. Originally named for the blue-green turquoise mined in the region beginning by early Pueblo people and subsequent mining communities such as Cerrillos, The Turquoise Trail encompasses a nearly 15,000 square mile radius in the heart of central New Mexico. 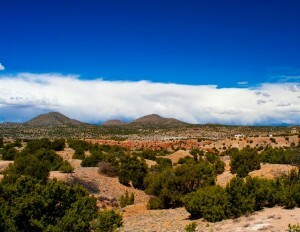 From the Galisteo Basin all the way down along the eastern side of the Sandias, the scenic 50 mile stretch between Santa Fe and Tijeras is a beloved day drive for tourists and locals alike. Recreational living is a big part of living on The Turquoise Trail. From hiking in The Ortiz Mountains to mountain biking along sweet single track in Otero Canyon outside of Tijeras, the trail is also fast becoming known for its adventurous side. Yet although the area has seen recent growth, The Turquoise Trail remains historically and in some degrees visually the Old West. Spend a sunny afternoon at The Mineshaft Tavern in Madrid and you might feel like you've traveled back to the late 19th Century. In 2000, The Turquoise Trail was one of several nationally designated "Scenic Byways" in America.